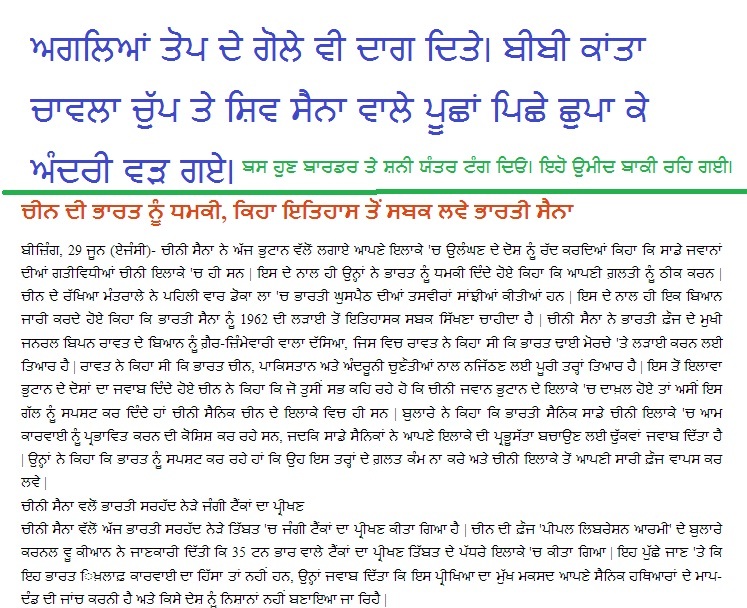 COMMUNAL RULER WHO HAD DISALLOWED SIKHS PILGRIMS CROSS BORDER GETS HIS DUE. ਹਿੰਦੂ ਹੁਕਮਰਾਨ ਫਿਰਕਾਪ੍ਰਸਤੀ ਦੀਆਂ ਸਾਰੀਆਂ ਹੱਦਾਂ ਬੰਨੇ ਪਾਰ ਕਰ ਰਿਹਾ ਹੈ। ਪਰਸੋ ਇਸ ਨੇ ਸਿੱਖ ਯਾਤਰੀਆਂ ਨੂੰ ਨਨਕਾਣਾ-ਕਰਤਾਰਪੁਰ ਦੇ ਦਰਸ਼ਨਾਂ ਤੋਂ ਮਹਿਰੂਮ ਕਰ ਦਿਤਾ ਜਦੋਂ ਯਾਤਰੂਆਂ ਨੂੰ ਬਾਰਡਰ ਪਾਰ ਨਹੀ ਕਰਨ ਦਿਤਾ। ਹਾਂਲਾ ਵੀਜੇ ਭਾਰਤ ਸਰਕਾਰ ਦੀ ਸਹਿਮਤੀ ਨਾਲ ਲਗੇ ਸਨ। ਪਰ ਬਾਬਾ ਬੜਾ ਬੇਅੰਤ ਹੈ। ਖਬਰਾਂ ਆ ਰਹੀਆਂ ਹਨ ਕਿ ਚੀਨ ਦੀ ਸਰਕਾਰ ਨੇ ਹਿੰਦੂ ਯਾਤਰੂਆਂ ਨੂੰ ਕੈਲਾਸ਼ ਮੰਦਰ ਤਕ ਜਾਣ ਤੋਂ ਰੋਕ ਦਿਤਾ ਹੈ।ਉਂਜ ਸਾਨੂੰ ਇਨਾਂ ਯਾਤਰੂਆਂ ਤੇ ਤਰਸ ਆ ਰਿਹਾ ਹੈ ਕਿਉਕਿ ਗੁਰੂ ਦਾ ਸਿੱਖ ਸਰਬਤ ਦਾ ਭਲਾ ਮੰਗਦਾ ਪਰ ਨਾਲੇ ਅਜੇ ਕਲ ਟੀ ਵੀ ਚੈਨਲਾਂ ਤੇ ਹਿੰਦੂ ਯਾਤਰੀਆਂ ਨੂੰ ਖੁਸ਼ੀ ਵਿਚ ਨੱਚਦੇ ਦਿਖਾਇਆ ਸੀ। ਸਿਰਫ ਏਨਾ ਹੀ ਨਹੀ ਚੀਨ ਨੇ ਭਾਰਤੀ ਚੌਕੀਆਂ ਵੀ ਢਾਹ ਦਿਤੀਆਂ ਹਨ ਤੇ ਤੋਪ ਦੇ ਗੋਲੇ ਵੀ ਦਾਗੇ ਹਨ। ਹਿੰਦੂਆਂ ਨੂੰ ਕਿਹਾ ਗਿਆ ਹੈ ਕਿ ਆਪਣੀ ਔਕਾਤ ਵਿਚ ਰਹੋ। 1962 ਵਾਲਾ ਸਬਕ ਨਾਂ ਭੁੱਲੋ। ਹੁਣ ਫਿਰਕਾਪ੍ਰਸਤ ਦਿੱਲੀ ਬੈਠੇ ਸ਼ਾਂਤੀ ਸ਼ਾਂਤੀ ਦੀ ਰੱਟ ਲਾ ਰਹੇ ਨੇ। ਓਧਰ ਬੀਬੀ ਕਾਂਤਾ ਚਾਵਲਾ, ਮਨਿੰਦਰ ਬਿੱਟਾ ਤੇ ਆਰ ਐਸ ਐਸ/ਸ਼ਿਵ ਸੈਨਾ ਦੇ ਸੈਨਕ ਪੂਛਾਂ ਹੇਠਾਂ ਦਬਾ ਕੇ ਅੰਦਰੀ ਜਾ ਵੜੇ ਹਨ। ਪੜੋ ਸਾਰੀਆਂ ਸਬੰਧਤ ਖਬਰਾਂ। Please see an interesting video given at the end. 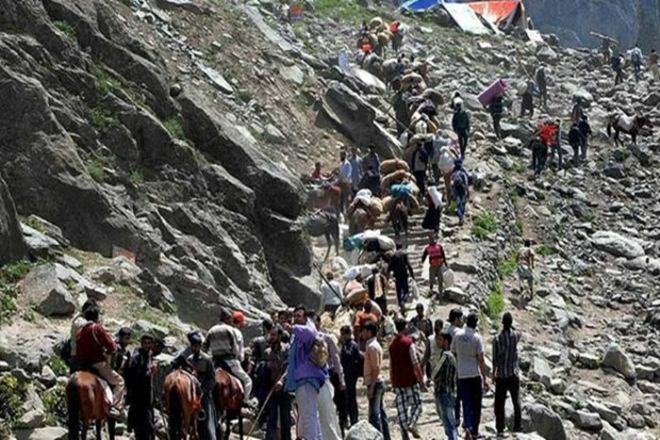 China has refused entry to around 50 Indian pilgrims who were scheduled to travel to Kailash Mansarovar through the Nathu-la pass in Sikkim following which India has taken up the issue with Beijing. China has refused entry to around 50 Indian pilgrims who were scheduled to travel to Kailash Mansarovar through the Nathu-la pass in Sikkim following which India has taken up the issue with Beijing. 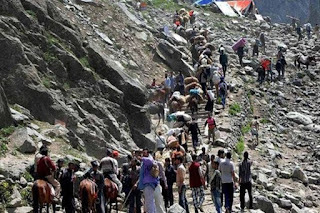 External Affairs Ministry Spokesperson Gopal Baglay said some difficulties are being experienced in the movement of pilgrims through Nathu La. “Yes, there are some difficulties being experienced in movement of KMY (Kailash Mansarovar Yatra) Yatris via Nathu La. Matter is being discussed with Chinese side,” he said replying to a query on the matter. The development comes amid tensions in bilateral ties between the two countries over a host of issues including the CPEC and India’s NSG bid. Sources said 47 yatris and the liaison officer were stopped as roads in the Chinese side have been washed away by landslides triggered by continuous rainfall. The Indian pilgrims were informed that they would be allowed to enter China when the weather and the road conditions improve.The yatris returned to Gangtok today. The first batch of 47 yatris had arrived in Gangtok on June 15. The Sikkim Tourism Development Corporation is the nodal authority for conducting the annual yatra through Nathu La. Hundreds of Indian pilgrims undertake Kailash Mansarovar yatra in the Tibetan Autonomous Region of China every year negotiating the mountainous terrain. A Sikh jatha was denied permission by the Union Government today to travel to Pakistan to observe the death anniversary of Maharaja Ranjit Singh. Dejected pilgrims raised slogans against the Centre. Earlier, the Centre had denied nearly 80 pilgrims heading for Pakistan to observe the martyrdom day of Guru Arjan Dev permission to board train at Attari railway station on June 8. A group of 282 pilgrims today assembled at the railway station and waited for hours for the special train to come from Wagah in Pakistan. 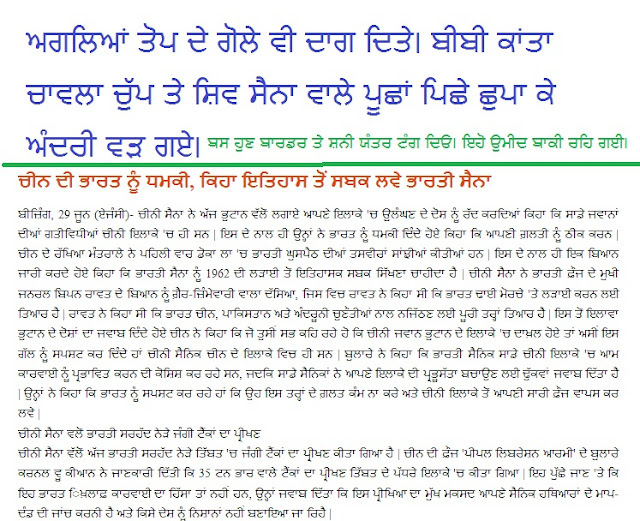 The pilgrims did not include jatha from the SGPC as the Centre had declined their request for security reasons. 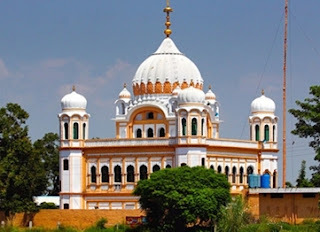 The pilgrims were mostly associated with International Bhai Mardana Yadgari Kirtan Darbar Society, Khalra Mission Committee, Nankana Sahib Yatri Jatha and Delhi Akali Dal. Kirtan Darbar Society president Harpal Singh Bhullar said the Railways staff told the pilgrims that they did not receive any approval for allowing their travel on the train from Pakistan. He, however, released a video showing Pakistan’s Wagah station where a special train was stationed and several banners were put up for welcoming the Sikh jatha. Attari railway station superintendent AK Gupta said the special train from Pakistan was not scheduled to arrive today.